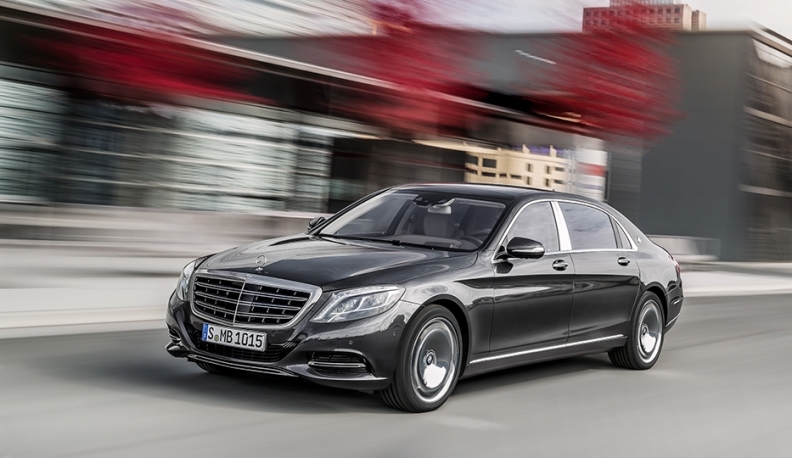 FRANKFURT (Bloomberg) -- Mercedes-Benz's new Maybach version of its flagship S class is challenging Bentley and Rolls-Royce for supremacy among customers who enjoy a chauffeured car's back seat. Presented almost simultaneously on Wednesday at auto shows in Los Angeles and Guangzhou, China, the new sedan is 305mm (12 inches) longer than the standard S class and will cost less than 200,000 euros ($250,800) when it reaches showrooms in February. Buyers can add opulent touches such as hand-made silver-plated champagne goblets to help executives relax while being driven to the next business meeting. Mercedes is reviving Maybach as a subbrand, much like its AMG performance unit, to regain a foothold among the ultra-rich. An earlier attempt to restore the 1930s-era marque as a stand-alone brand ended in 2012 after Maybach -- named after an early collaborator of Gottlieb Daimler, one of the automaker's founders -- failed to gain traction in the global market. "At the top end of the spectrum, in the luxury part of the market, it's all about image and tradition," said Carlos Da Silva, an analyst for IHS Automotive. "When you're driving a Rolls-Royce, you're making a statement. When you drive a Maybach, you may need to explain a little more." After slipping behind BMW and Audi in global luxury sales, Daimler's Mercedes brand is building on the S class to cement its reputation for comfort and lavishness even as it seeks to address younger buyers with cheaper cars such as the CLA coupe. The new Maybach fits two reclining rear seats reminiscent of an airplane's business class into a cabin with a raised roof line to increase headroom. Special seals and a lining in the wheel well shield passengers from outside noise, and there are two adjustable fold-out tables stored in the center console. A two-section glass roof lets natural light in. At the touch of a button, the panorama window can be darkened to keep pedestrians from peering into the car in city traffic. The top-line version of the car comes with a V-12, 530-hp engine that can push the 5486mm vehicle to 100kph (62 miles) in five seconds. Still to come are an open-top version of the S class model and, next year, an even more luxurious three-row Pullman model.